Inside your gastrointestinal tract are trillions of micro-organisms, including bacteria, fungi and viruses. You have roughly the same number of micro-organisms in there as you do human cells in your entire body. But only 10% to 20% of the bacteria you have in your gut will be shared with anyone else. These microbiomes differ hugely from person to person, depending on diet, lifestyle and other factors, and they influence everything from our health to our appetites, weight and moods. But despite being one of the most-researched parts of the body, there’s still a long way to go to fully understanding our guts. The connection between the gut and brain, commonly referred to as the “gut-brain axis,” has been heavily researched and documented. It started in 1930 when two researchers, Pillsbury and Stokes, discovered that depression was linked to a change in the bacterial composition in the gut. And this alteration was further linked to skin inflammation. So the intimate connection between the gut and skin isn’t entirely new and is undeniable. It is well known that many gastrointestinal disorders present in the skin. We see patients with dermatitis herpetiformis and know to test them for celiac disease and are well attuned to the particular skin manifestations of inflammatory bowel disease. Even psoriasis is more commonly found in patients with Crohns disease than in the general population. Plus, it is well known that food allergies can cause urticaria while eating foods such as dairy, processed carbohydrates and sugar have been linked to acne and eggs have been shown to be an exacerbating factor in certain infants with eczema. Leaky gut syndrome is a condition in which the intestinal walls develop increased permeability and is known to create autoimmune responses that may result in breakouts and rashes on the surface of the skin. Nevertheless, the concept of a “skin-gut axis” and related research is still emerging as an important and intriguing topic in dermatology and gastroenterology alike to help us better understand this connection. 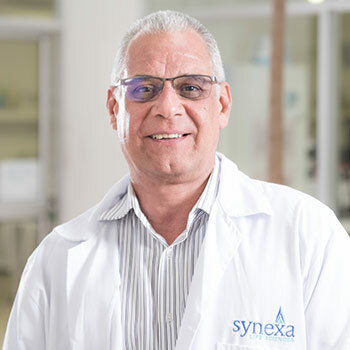 The team at Atlantic Dermatology and Laser are excited to partner with Professor Bouic and his dynamic researchers and scientists at Synexa Life Sciences to offer our patients the very latest in gut health testing. Founded in 2003 as an early pioneer in the new field of biomarker services, Synexa Life Sciences has grown and developed a wide-spread reputation for their forward-thinking research on gut health. This collaboration is focused on understanding how diet, medications, and psychosocial stress can influence or contribute to altered microbial communities in the gut, which may directly or indirectly affect skin health. Synexa has developed innovative panels to quantify and interpret the gut microbiome and to test in particular for leaky gut syndrome. Food intolerance testing provide insights into how your diet could be compromising optimal gut health and contributing to your inflammatory skin conditions. Professor Bouic’s expertise as a Professor of Immunology and Synexa’s scientific, problem-solving culture are the perfect match for our integrative approach to dermatology at Atlantic Dermatology and Laser.